The most important thing for a product manager, is to be right. If you’re not right over 80% of the time, you’re just not cutting it. If you use all the right tools, but are still wrong, it doesn’t matter. And if you’re right and don’t use any tools, it doesn’t matter. But of course, using the right tools can help you be right more often, so let’s take a look at some of the tools that help you do that. 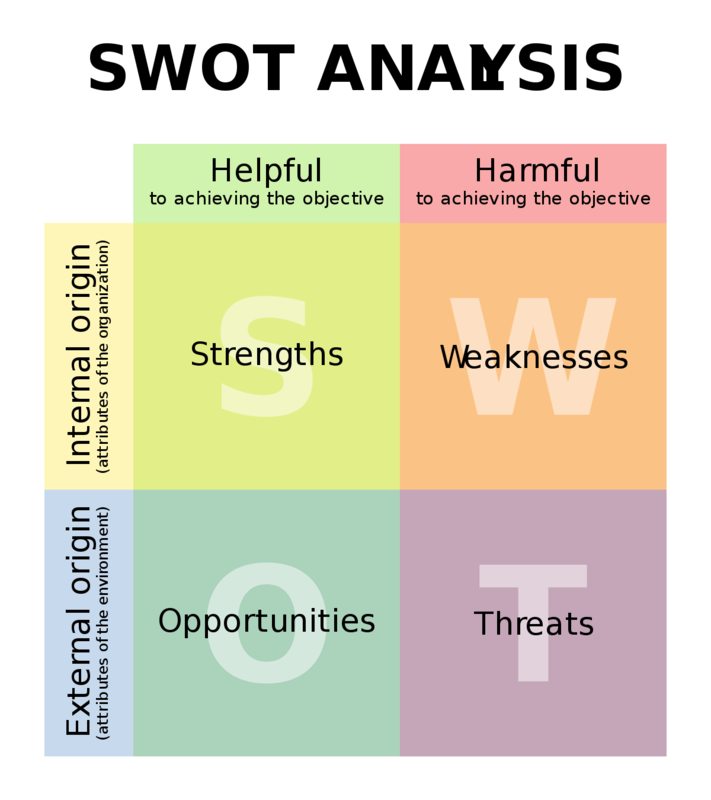 There’s always the classic SWOT analysis (Strengths, Weaknesses, Opportunities, Threats). It’s a simple tool that helps you get the lay of the land, so to speak. In a startup, you likely already know the answers, but sometimes writing things down helps crystalize things, or at least communicate things to other people that haven’t thought about it as much. I don’t use it much personally, but if you’re new to this, it’s a great place to start. “SWOT en“ by Xhienne - SWOT pt.svg. Licensed under CC BY-SA 2.5 via Wikimedia Commons. In an early stage startup, you’ve got to have a great vision for where you’re going (and a mission and shared values), but that doesn’t mean having a rigid 3 year roadmap. Your world changes too quickly and you’re learning new things about your business every day. But that also doesn’t mean you don’t need planning at all. You have to make sure you’re doing the most valuable work at any given time. Just focus on one quarter at a time. Specifically, answer the question, what would be stupid for us not to do in the next 90 days? Make sure to include your customers’ perspective in the planning, but don’t forget to ask engineering as well. They’re close to the problem and have great ideas that customers may never ask for, yet truly need. Why is now the time to solve it? Roughly how much effort is involved and from which teams? How is this going to help us achieved our business objectives? Then filter the ideas down to the most important big ideas. Get the exec team together and vote on them. Remember, focus means saying “no” to a thousand good ideas. When working on a project, don’t get caught up in defining everything up front, even if you’re only looking at 3 months or less. The sooner you get things out of your head and into customers hands, the faster you’ll learn. I’m a big fan of product discovery popularized by The Lean Startup movement. Ship small and iterate. Your team will grow too large to do the above planning all together. And really, at some point your company will be capable of delivering more than one person can organize. You’ll need to hire more product managers, and divide up the product space. Resist the temptation to keep central control over everything. Empowering small teams, each with a product manager, to make decisions about what they work on is incredibly powerful. The people closest to the work should be trusted to know what to tackle next. And teams work best when they’ve been working together for a while so durable feature teams are your friend. But don’t let it devolve into anarchy. Your teams need to be aligned to common goals. A compelling and well-articulated vision is key here. Eventually, as your startup grows, you’re going to need a roadmap. Especially for enterprise customers, they’re not just buying your product, they’re buying the future version of you. But rather than submit to their demands, create an agile roadmap that understands that you can only see clearly for so far and your vision gets blurry past 6 months. Start with your product vision, brainstorm ideas, separate the big “boulders” from the “pebbles”, then categories the boulders by level of commitment. Don’t be too concerned about making sure everything is committed with a timeline. Some projects can be worth committing to even if you don’t have a clear idea how long they’ll take to finish. Then of course there’s those projects you can’t completely commit to, but will likely deliver at some point. And then there’s the big visionary stuff; the ideas that might not show up in a year, or even five years, but these aspirational goals help define you. Lastly, it’s just as important to write down what you won’t do. Once you’ve got all that, you can cluster things down into a sharable roadmap. Also consider the “problem roadmap“ rather than the “product roadmap”. Yeah, you can try out the Lean Canvas, especially if you’re still pre-funding. I haven’t used it myself, and I find the format rather dry, but it seems to be gathering momentum. Well, that’s all I’ve got time to cover today, and I feel like I’ve left out a lot of great pieces like balancing customer requests, metric-moving improvements, and visionary features. And the Think Big, Think Small exercise. Maybe I’ll cover those another day.